If you’re looking to get away from the real world for just a moment, you may want to catch the next plane to the Atlanta Botanical Gardens. Once there, you will be able see magical plant sculptures that you otherwise could only find in your imagination. Created by nonprofit International Mosaiculture of Montreal, the Imaginary Worlds exhibit takes you away from reality to travel into a world of make-believe with fictional and fantastical plant sculptures. The sculptures are part of the mosaiculture art form, which uses molded steel structures as the platform on which artists position plants and flowers. 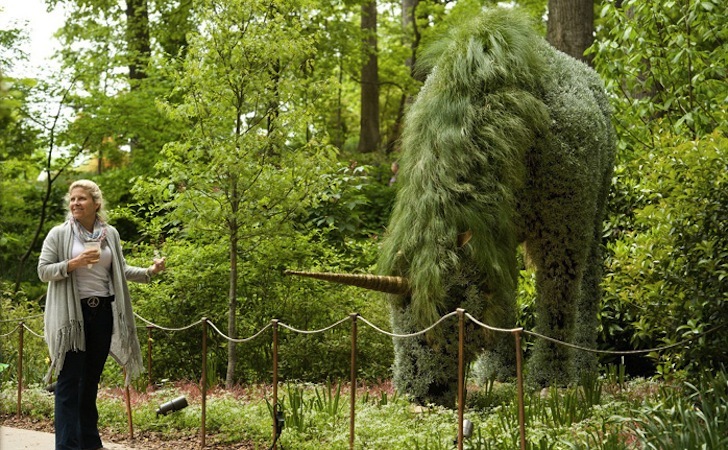 This particular type of plant art can be put together quickly, making for some spectacular botanical garden exhibits like Atlanta’s Imaginary Worlds. Underneath these sculptures is a complex irrigation system to hydrate the plants, keeping them lush and green in Atlanta’s intense heat for the exhibit. Imaginary Worlds runs through May until the end of October, so don’t miss your chance to tap into your imagination and escape the real world for just a moment.